my first attempt to replace the belt resulted in a broken belt. Does anyon e have a video or a couple photos showing how I can release tension to inst all new belt? It is a Chinese 9 X 20 late with the original model number being ENCO 110-0 820, but then I have some other model numbers that I think are the MSC numb ers: Model CQ6123B and 1100517. You pull the big knob/lever in the upper left toward the front. The belt is in the released position in this image. Thanks for the quick reply. I am familiar with the lever and how it releas es tension on the skinnier v-belt (part #237, shown on P. 57 in the Grizzly manual, which I appreciate your sending me the link to! )?.but I am trying to replace the drive belt (#138b). That lever does not seem to rel ease tension for that belt. I had thought maybe I could take off the v-bel t and slip the drive belt behind and then just sort of rotate the shaft whi le sqeezing the drive belt onto its gear, but it just seems too tight. Maybe I?m just missing something?.any thoughts? ses tension on the skinnier v-belt (part #237, shown on P. 57 in the Grizzl y manual, which I appreciate your sending me the link to! )?.but I a m trying to replace the drive belt (#138b). That lever does not seem to re lease tension for that belt. I had thought maybe I could take off the v-be lt and slip the drive belt behind and then just sort of rotate the shaft wh ile sqeezing the drive belt onto its gear, but it just seems too tight. eases tension on the skinnier v-belt (part #237, shown on P. 57 in the Griz zly manual, which I appreciate your sending me the link to! )?.but I am trying to replace the drive belt (#138b). That lever does not seem to release tension for that belt. I had thought maybe I could take off the v- belt and slip the drive belt behind and then just sort of rotate the shaft while sqeezing the drive belt onto its gear, but it just seems too tight. Thanks much....I'll give it a shot! Dave - the machine I use is, like yours, by number an Enco 9x20. It has 2 belts, a v type & flat one. The v can be shifted from speed to speed with no adjustments by forcing the belt off one channel of one sheave & forcing on with the other. Sounds like what you are doing. You may have the tension adjusted too tight. Maybe you need a different length v belt. But, what you are doing is, by my experience, doable. the v-belt, there does not seem to be an obvious way to loosen the tension and my first attempt to replace the belt resulted in a broken belt. Does a nyone have a video or a couple photos showing how I can release tension to install new belt? 10-0820, but then I have some other model numbers that I think are the MSC numbers: Model CQ6123B and 1100517. Hi, Hul--I'm actually trying to replace the flat one. The v-belts I can do , but the flat one is toast and I can't quite figure out how to loosen tens ion enough to put it on. I'm going to try Leon's idea of loosening a nut.. ..if I can find that nut. If you have any other suggestions, I'd love to h ear 'em! Thanks! Gonna give that a shot tonight. Separately, do you know how you tighten/lo osen the tension on the v-belt? ike the v-belt, there does not seem to be an obvious way to loosen the tens ion and my first attempt to replace the belt resulted in a broken belt. Do es anyone have a video or a couple photos showing how I can release tension to install new belt? CO 110-0820, but then I have some other model numbers that I think are the MSC numbers: Model CQ6123B and 1100517.
n do, but the flat one is toast and I can't quite figure out how to loosen tension enough to put it on. I'm going to try Leon's idea of loosening a n ut....if I can find that nut. If you have any other suggestions, I'd love to hear 'em! Thanks! Dave - from the looks of the drive mechanism, the motor need be moved up or down. And again from the looks of it, it's a messy job. If you find an easier way, let me know. Do you get what you pay for in Carbide inserts? 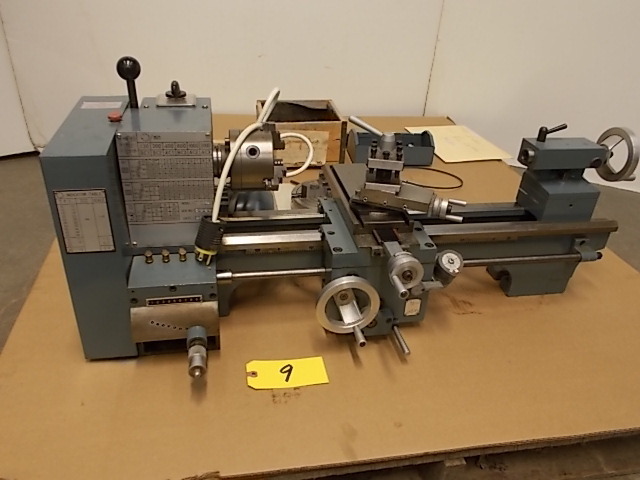 Strange Threaded Lathe Spindle Size?